Israel doesn’t really have any traditional clothes of its own. Most traditional clothes are associated with country of origin. Yemeni Jews, for example, are known for their elaborate female headdresses and colorful clothes. Over 300 different ethnic costumes are displayed at the Haaretz Museum in Tel Aviv. The traditional Israeli costume is worn by Israeli folk dancers. These garments are generally basic and simple in design—a knee-length dress for women and loose-ftiing trousers and shirt for men— and have colored braid or contrasting materials for decoration. The braid is generally around the sleeves and the hems of the skirt and run vertically on the shirts or the top part of a dress. Morning Torah reading Prayers are regarded as obligatory but the setting is not. They can be performed at anywhere and anytime. 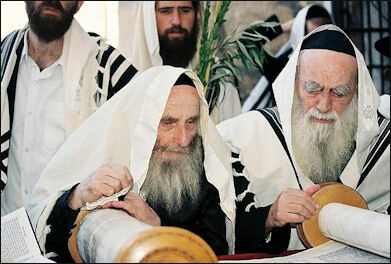 Ideally, however, set prayers are recited in a miryan , a group of at least 10 men, in a synagogue. 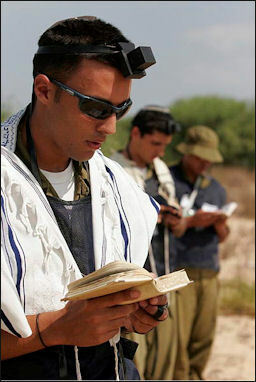 During prayer Jews are supposed to cover their head (men wear a yarmulke ). Men also cover their shoulders or head with a fringed prayer shawl called a tallit . Orthodox men always wear a small version of the prayer shawl under their clothes and always have their heads covered. The colors on the Jewish prayer shawl are on the Israeli flag. 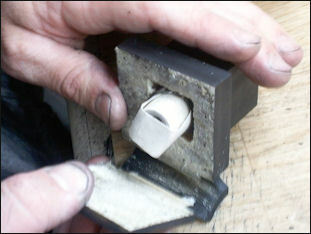 During prayers some Jews wear tefillin , a black leather box with passages of the shema from the Torah coiled inside. The tefillin is worn on the head and sort of resembles the thing doctors used to wear on their head. Jews who wear these phylacteries ascribe to the dictum from Exodus calling on males to wear "a memorial between the eyes." “We also have a huge selection artisanal kippahs from Jerusalem-based artist Yair Emanuel. These feature raw silk kippahs in a variety of colors with a colorful Old Jerusalem motif embroidered around the edge. Also available is a flower motif embroidered on raw silk in a variety of hues. Several of his kippahs are completely covered in tight embroidery, giving them an Eastern crafts aesthetic. These include a bird design, as well as an old Jerusalem motif, available in blue, gold on white, and silver on white. Emanuel also offers a series kippahs in which he has hand painted in gold. These include an Old Jerusalem motif, as well one with the symbols of the different Jewish tribes. In addition to these we have the standard knitted kippahs, available in a variety of colors. These can be monochrome or two-tone. They can also come an embroidered Star of David. Is it Appropriate for a Non-Jew to Wear a Yarmulke? One person replied: “I think the key points are that it's entirely appropriate, even expected, for a non-Jew to do so at holy (Jewish) places, and not necessarily inappropriate elsewhere, but it could be seen as offensive to do so while taking part in activities that observant Jews would not — eating at a non-kosher restaurant, driving and the like on Shabbat, etc. Another said: “As a potential convert you should wear a kippa. In any case everyone is required to cover their head in holy places, men with a kippa or hat, including non-Jews. Another posted: “When someone wears a yamulke all the time he is sending out a certain message. Many of the things you do would most likely be contrary to that message. BTW learning to be proud of who you are is part of being Jewish. That means, if one is Orthodox they don't hide their religion--even if they are surrounded by BDS folk. Why not really educate yourself to the facts and then welcome the discussion. You may be surprised at how unaware of facts, most of them really are. 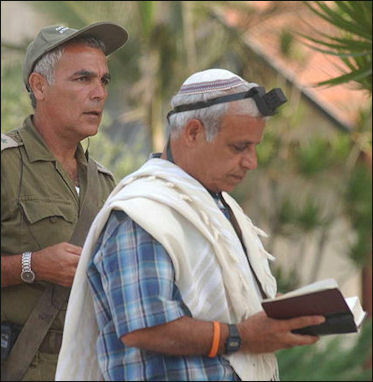 Another said: “At Jewish holy sites and synagogues, Jewish men and Gentiles alike are required to cover their heads with a KIPPA (the Hebrew word for the Yiddish term 'yarmulke') or any sort of hat. Jewish law requires men to cover their heads - the type of head covering is of no importance. In Israel, the kippa has become politicized. The type of head covering a man wears here tells others about his theology and world view. A knitted kippa is the head covering of most modern Orthodox religious Zionists. A black kippa is typically the head covering of ultra-Orthodox Jews who are usually neutral towards (or may even oppose) modern political Zionism. Yet another said: “The politics of kippot apply more to Israelis. Jewish tourists, including some who don't wear a kippa all the time back home, often choose to wear a kippa in Israel, and choose whatever style they like, so I don't think there's a big danger of being misunderstood. For guidance on taking on religious practices you should speak to your rabbi rather than a travel forum, but I think that as a rule of thumb you received good advice above, that it's fine unless you're doing something that obviously contravenes Jewish law. wearing a tefillin Tefillin (also called phylacteries) are two small cubic black leather boxes that contain verses from the Torah. They are worn on the head and on one arm and are held in place by leather straps in accordance with line from Deuteronomy that reads: “And you shall bind them as a sign upon your hand, and they shall be as frontlets between your eyes.” Observant men and boys who have had their Bar Mitzvah usually wear tefillin on their head and their arm during weekday morning prayer. Women do not usually wear tefillin, though this practice is changing. Deuteronomy 11:1-32 reads: “ And you shall write them on the doorposts of your house and on your gates. You shall therefore lay up these words of mine in your heart and in your soul; and you shall bind them as a sign upon your hand, and they shall be as frontlets between your eyes. And you shall teach them to your children, talking of them when you are sitting in your house, and when you are walking by the way, that your days and the days of your children may be multiplied in the land which the LORD swore to your fathers to give them, as long as the heavens are above the earth. Covered from head to toe in black, Hasidic men wear ankle-length frock coats ( rekel ) and broad, round-rimmed Fedora-style hats. 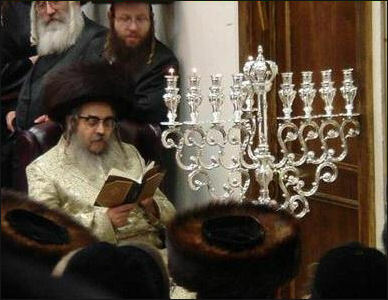 On the Sabbath and holidays they wear sombrero-style fur hats ( streimel ). 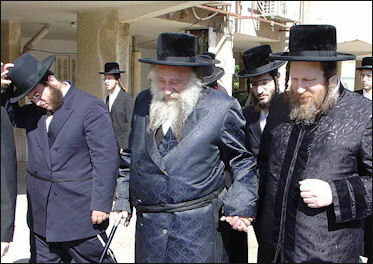 Ziziths are ritual fringes that hang below the hems of suits that remind ultra-Orthodox Jews of the Lord’s commandments. Like conservative Muslim women, Hasidic women are mostly hidden away in the houses. When they do come out their arms, necks. legs and heads have to be covered, usually in black. Some married women shave their heads and wear wigs when they go out. Men and women wear their traditional clothes even during the hottest months of the summer. 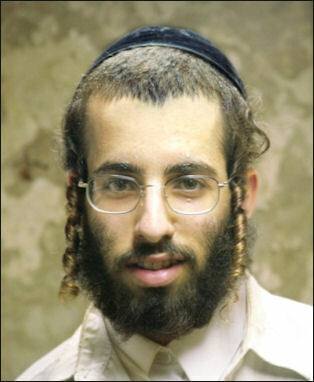 Hasidic Jews often beards and long hair like the prophets in the Bible. One famous rabbi never got a haircut because it would have meant removing his yarmulke, which would have obligated him to stop learning. Text Sources: Internet Jewish History Sourcebook sourcebooks.fordham.edu “World Religions” edited by Geoffrey Parrinder (Facts on File Publications, New York); “ Encyclopedia of the World’s Religions” edited by R.C. Zaehner (Barnes & Noble Books, 1959); “Old Testament Life and Literature” by Gerald A. Larue, King James Version of the Bible, gutenberg.org, New International Version (NIV) of The Bible, biblegateway.com Complete Works of Josephus at Christian Classics Ethereal Library (CCEL), translated by William Whiston, ccel.org , Metropolitan Museum of Art metmuseum.org “Encyclopedia of the World Cultures” edited by David Levinson (G.K. Hall & Company, New York, 1994); National Geographic, BBC, New York Times, Washington Post, Los Angeles Times, Smithsonian magazine, Times of London, The New Yorker, Time, Newsweek, Reuters, AP, AFP, Lonely Planet Guides, Compton’s Encyclopedia and various books and other publications.